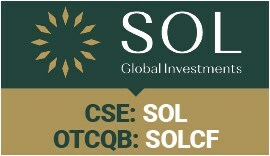 April 8, 2019 (Source) — SOL Global Investments Corp. (“SOL Global” or the “Company“) (CSE: SOL) (OTCQB: SOLCF) (Frankfurt: 9SB) is pleased to announce the completion of its acquisition of CannCure Investments Inc. (“CannCure“), a privately-held Ontario corporation that indirectly holds 100% of 3 Boys Farms, LLC (“3 Boys Farms“), a Florida limited liability company with a Florida state license to cultivate, process and dispense medical marijuana. Pursuant to the terms of an amended and restated share purchase agreement (the “Amended Purchase Agreement“) between the Company, CannCure and the shareholders of CannCure (the “Sellers“), SOL Global acquired all of the issued and outstanding common shares of CannCure for a revised purchase price of US$41,207,519, which was partially satisfied by the issuance of 7,317,500 common shares of SOL Global (“Consideration Shares“) at a negotiated price of CAD $4.00per share to the Sellers on a pro-rata basis. 3 Boys Farms’ operations consist of 40,000 square feet of fully-operational greenhouses located on an eight-acre parcel of land. The existing facilities include a two-acre odor mitigation space that is run 100% with harvested rainwater, solar pumps and repurposed high-volume chilled air from the cultivation greenhouses, resulting in a zero-carbon footprint. 3 Boys Farms’ innovations, including alternative energy use, greenhouse cooling designs, and rainwater harvesting, were recognized and honored by the Governor’s Environmental Leadership Award. Additionally, 3 Boys Farms has commenced extraction and processing operations at its new GMP-certified farm and laboratory facility in Indiantown, Florida. The new facility will also include 64,000 square feet of indoor cultivation and processing space and 50,000 square feet of greenhouses. Cultivation at the new facility is expected to commence in the third quarter of 2019. The new facility will add to the production capacity of 3 Boys Farms, which currently harvests approximately 350 pounds of premium-quality cannabis flower per month out of its facilities in Ruskin, Florida. Brady Cobb, the Chief Executive Officer and a director of the Company, was a shareholder of CannCure and received 239,414 Consideration Shares, representing 3.27% of the total number of Consideration Shares issued to the Sellers. Mr. Cobb declared his conflict-of-interest to the Company’s board of directors and did not participate in the ultimate decision-making deliberations of the board of directors regarding the acquisition of CannCure. The acquisition of CannCure was not a related party transaction as contemplated under Multilateral Instrument 61-101 – Protection of Minority Security Holders in Special Transactions in that Mr. Cobb was neither a director nor officer of SOL Global at the time SOL Global entered into a binding letter of intent to acquire CannCure in July of 2018. The forward-looking information contained in this press release includes statements relating to the terms and amounts of additional earn-out payments in the event of a future sale of 3 Boys Farms and the expansion of 3 Boys Farms’ operations. Forward-looking information is based upon certain material assumptions that were applied in drawing a conclusion or making a forecast or projection, including management’s perceptions of historical trends, current conditions and expected future developments, as well as other considerations that are believed to be appropriate in the circumstances. While we consider these assumptions to be reasonable based on information currently available to management, there is no assurance that such expectations will prove to be correct.